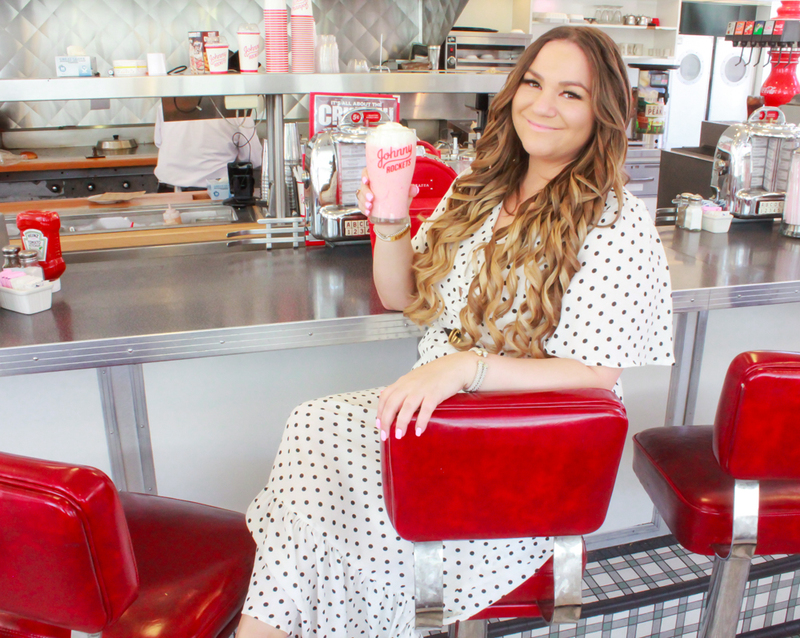 I have always been a fan of polka dots, especially when it comes to dresses. 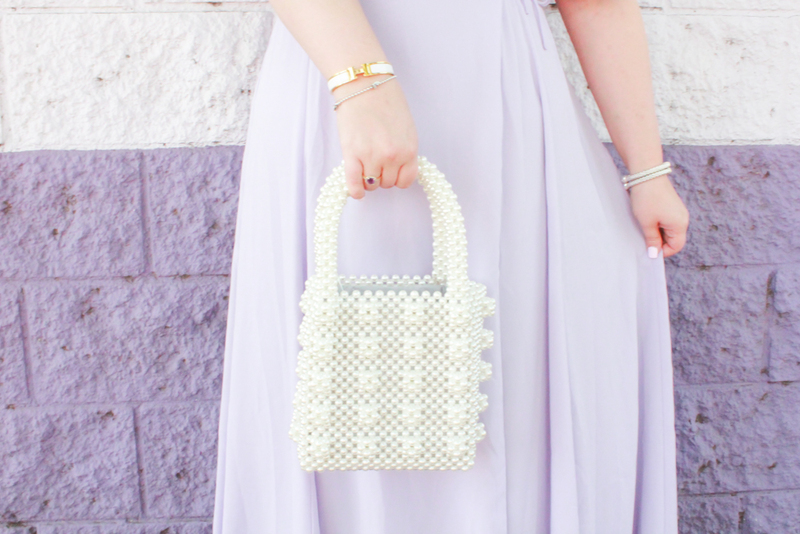 The design is so chic + feminine, perfect for my inner girly girl. 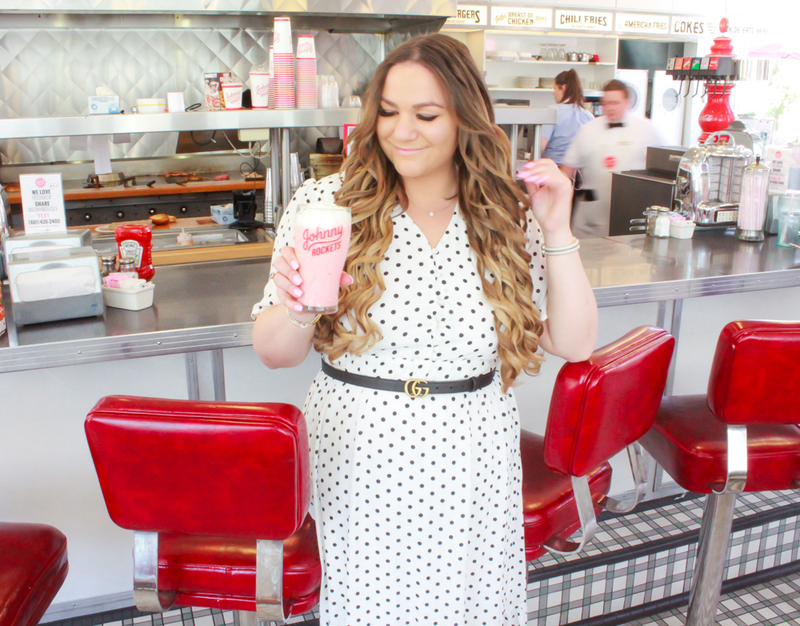 This dress is from an online boutique call Lucy Ave + I LOVE it! 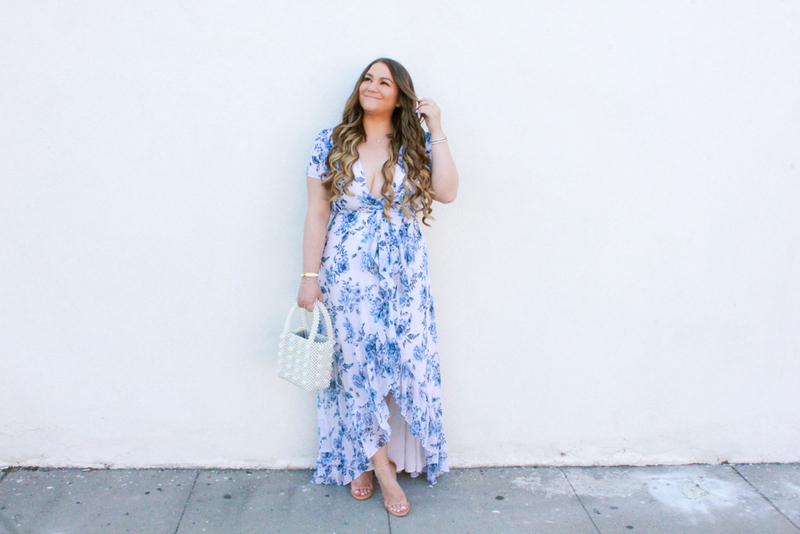 The fit, the style, the price…it’s a total MUST HAVE for your spring wardrobe! 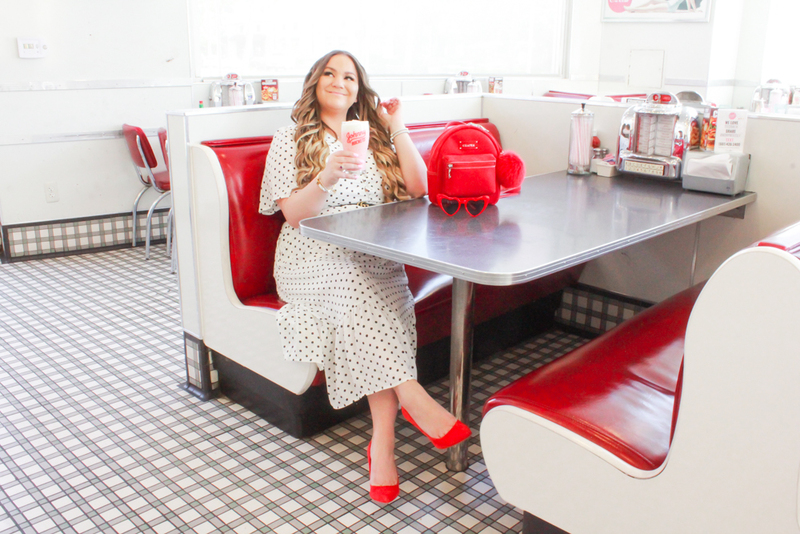 I planned this outfit to match the decor in Johnny Rockets so I paired this dress with classic statement making red suede pumps + red mini backpack…because as you all know, I LIVE for a bold ‘POP’ of Color! 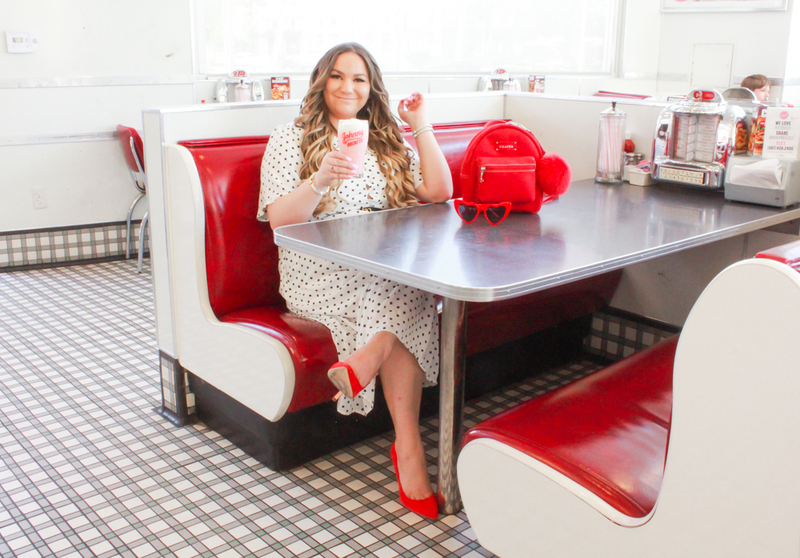 My biggest style motto is always incorporate Pops Of Color! If you don’t follow me on Instagram yet, I highly recommend you do hehe :p I love brightening people’s days through bright, colorful content + I started a little Quote Of The Day series on my instastories to spread good vibes daily. 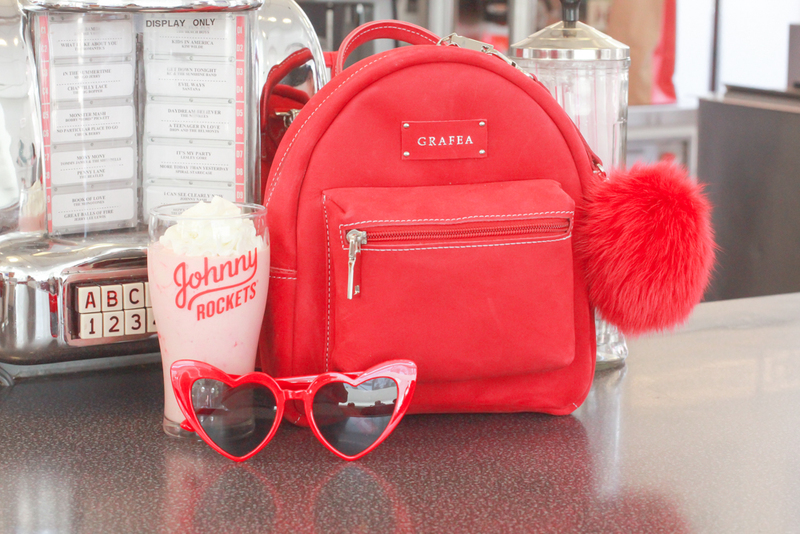 I got this mini red backpack from the UK brand Grafea + I am totally buggin (can you tell I watched Clueless while writing this? haha). 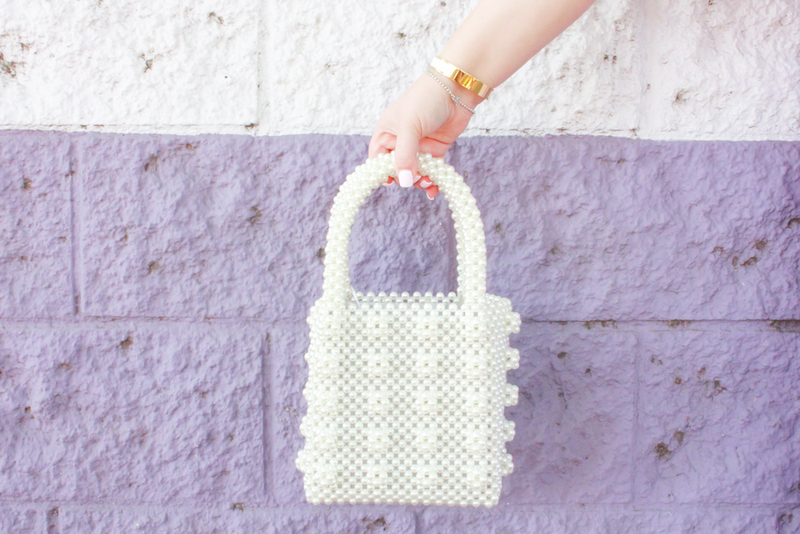 I have been obsessed with mini bags lately, especially backpacks + this one is a bright bold color AND comes with a cute pom pom accessory, I mean what more does a gal need?! 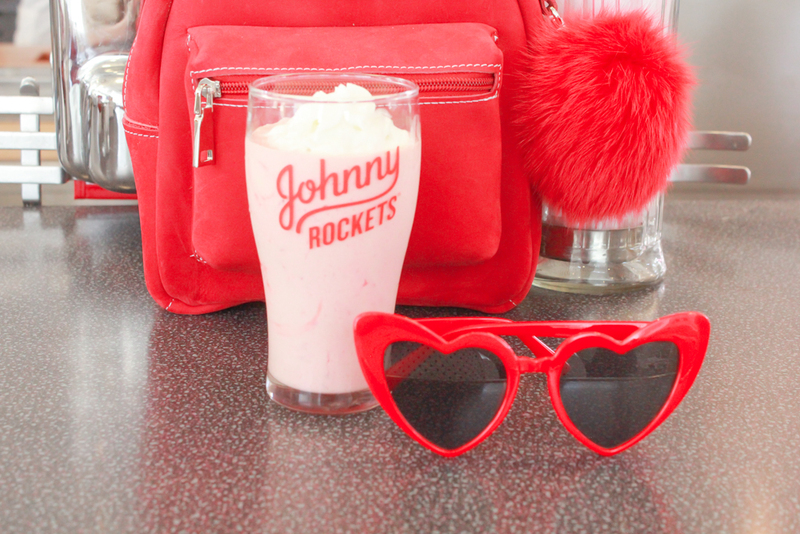 As for my sunnies…I mean how can you not find these heart shaped frames adorable? I bought them on Amazon in a set of 3 to have a variety of colors for under $20! Total score! My heels are my handy red suede pumps. 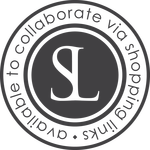 I style them constantly for work or play since they make such a chic bold statement matched with neutrals etc. 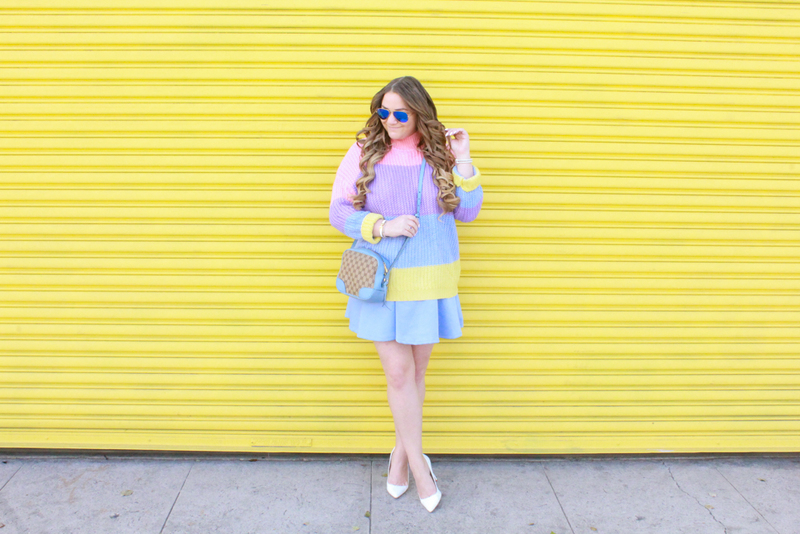 I don’t know about you but when I think of Easter, I instantly think of pastel colored Easter Eggs. Whether it’s decorating them, or hiding them, or having them as decor in your Easter basket, who doesn’t love some pastel eggs, am I right?! 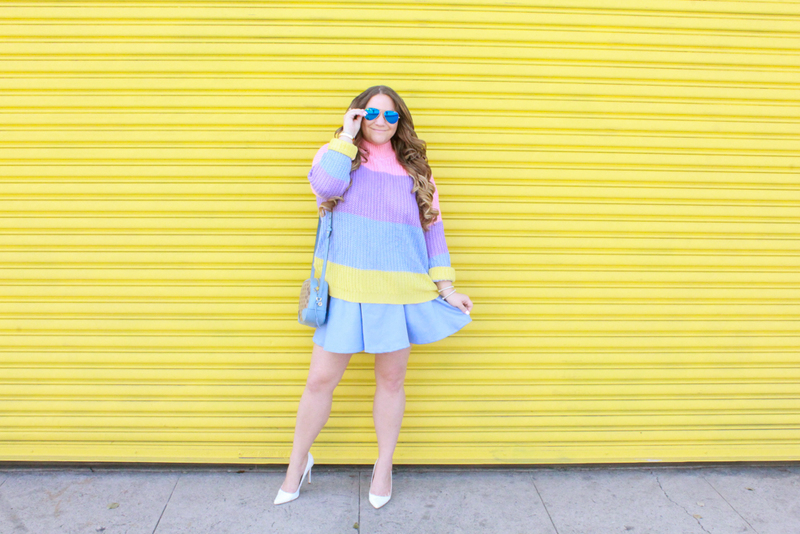 Well since Easter is around the corner I figured I’d style a look inspired by my favorite eggs…because why not, life’s too short to not stand out like a rainbow! First off let me just say, I am LOVING this sweater. 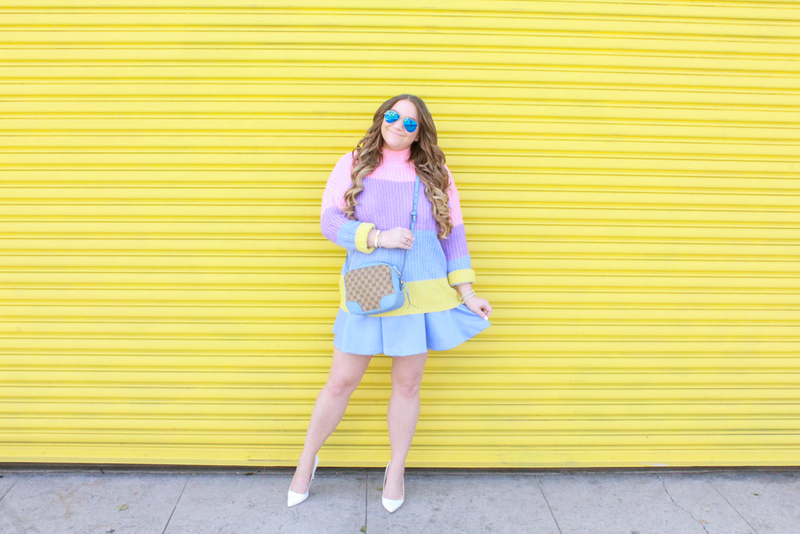 I have accumulated a plethora of rainbow sweaters as of late + this one is a favorite because of it’s pastel hues making it perfect for Easter + spring in general! 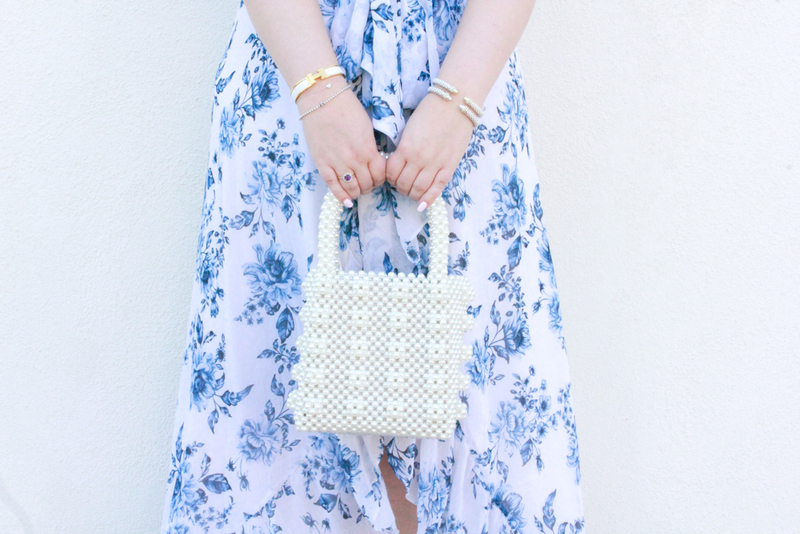 I styled it with a baby blue skater skirt – I have been stocking up on this style of skirt for under $20 from Amazon (it is so flattering + comes in a variety of different colors – like over 20+ to be exact). 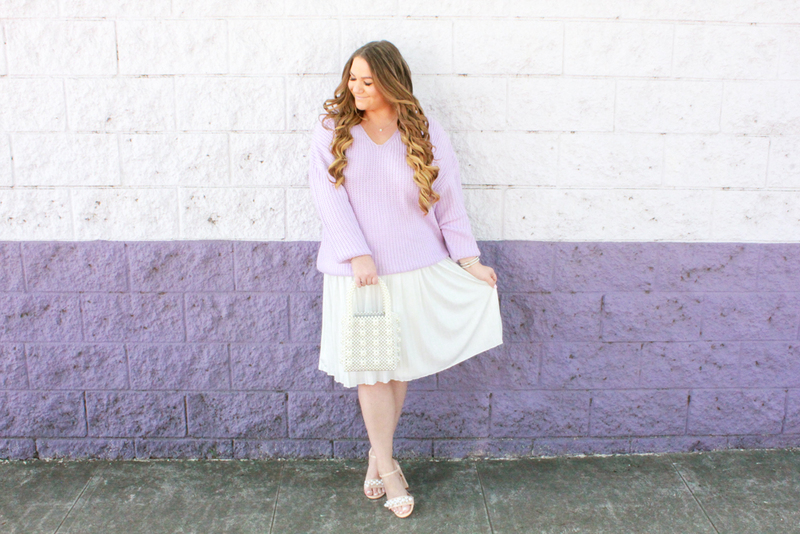 Skater skirts are great to pair with just about anything for a fun, flirty look! White pumps are a signature shoe every lady should have! 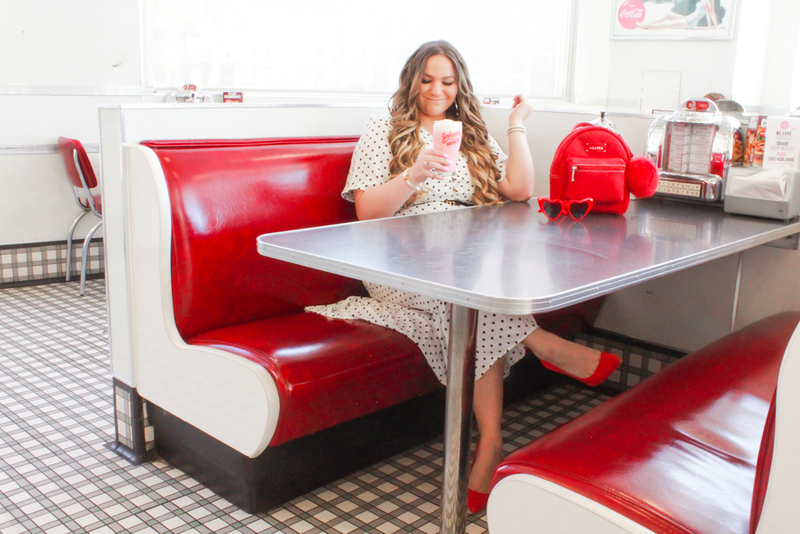 They are a chic classic you can never go wrong with + will last you for years to come, linking to some of my favorites along with my favorite Gucci bag below (similar styles as mine here is no longer available). 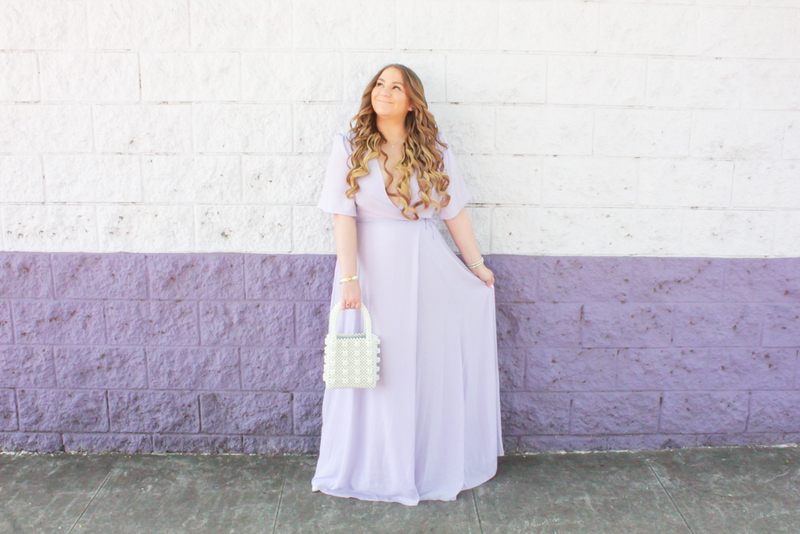 Pastel hues are the perfect go to for the spring season, especially with Easter just around the corner. 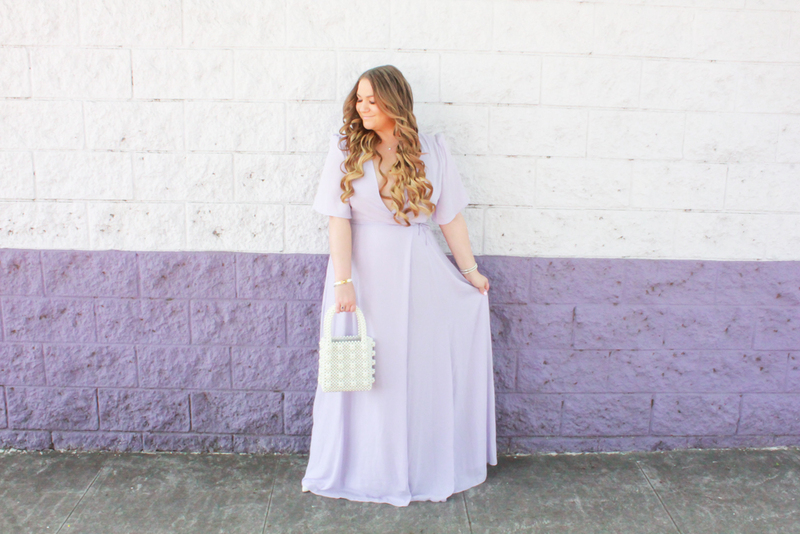 When I got this dress I instantly thought it was perfect for Easter with it’s long maxi style + wrap silhouette it is flattering, stylish + also chic enough for Sunday service or brunch or even dinner! 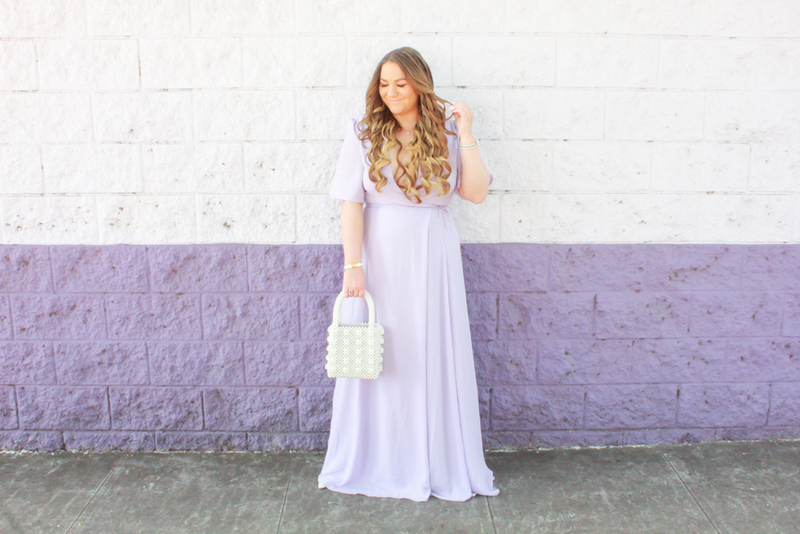 Whether you are looking for a feminine little princess moment or just a classic spring ensemble this look is sure to put a little ‘spring‘ in your step! 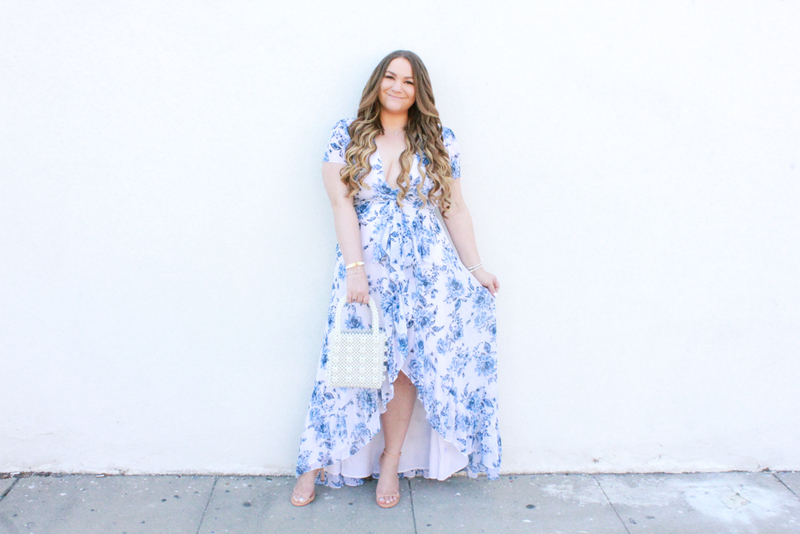 Wayf Clothing make the cutest dresses in my opinion – they are at a reasonable price point, available at all of your favorite stores like Nordstrom, Bloomingdales, Dillards etc AND they have a wide size range so every gal can look beautiful this spring! 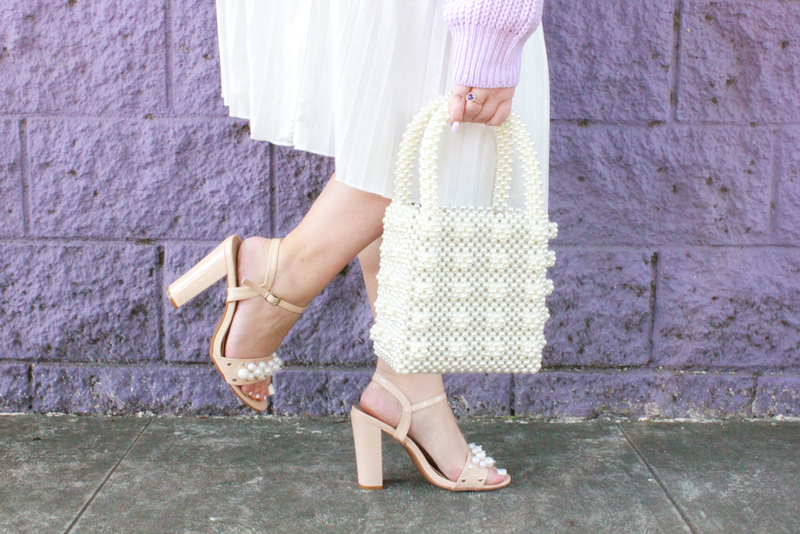 I paired it with classic white pumps (a key must-have for your spring into summer wardrobe) + the trendy pearl handbag you are seeing all over Instagram! The designer version is $500+ but this one is just $70 from Amazon. Honestly, I see this bag as the adult version of an Easter basket haha! How cute is it? 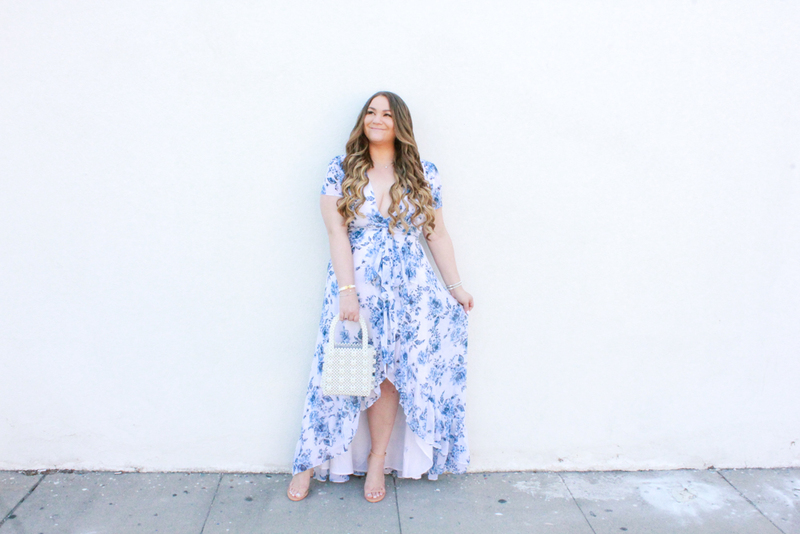 Perfect for special occasions or every day wear. 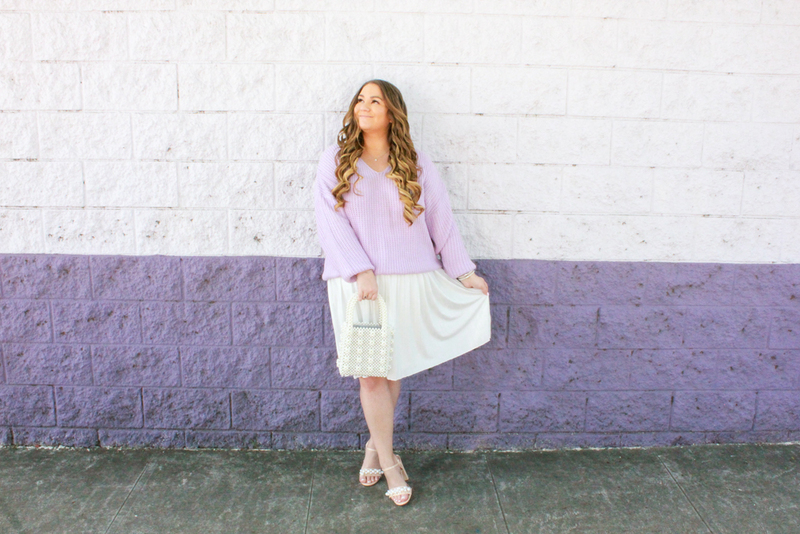 Spring is in full swing + that means although it is warming up here in LA, I am still living in cozy sweaters for those chilly spring mornings. My current go to? 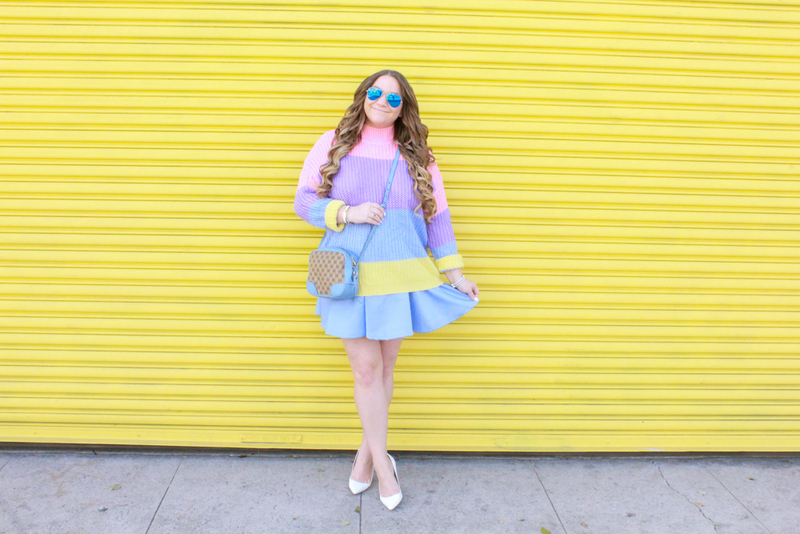 A fun pastel sweater like this one! 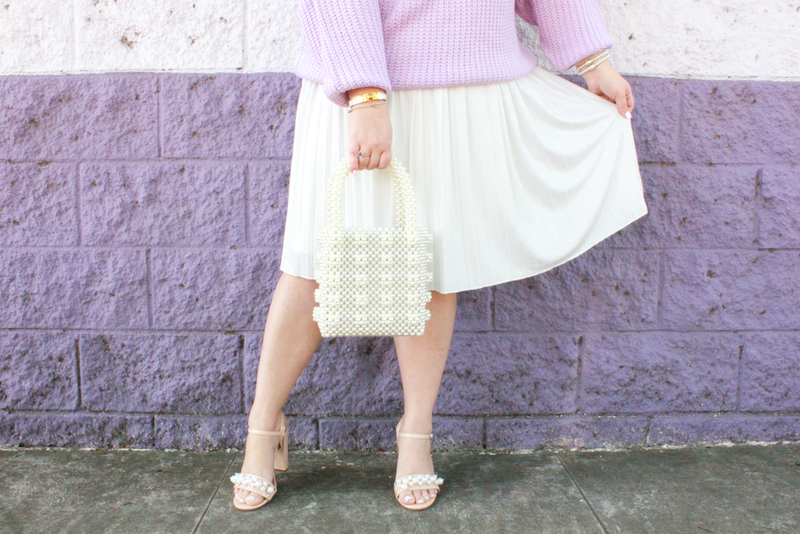 Whether you need a cozy moment for work or play, a sweater for spring doesn’t need to be boring when you wear some color…especially pastel! 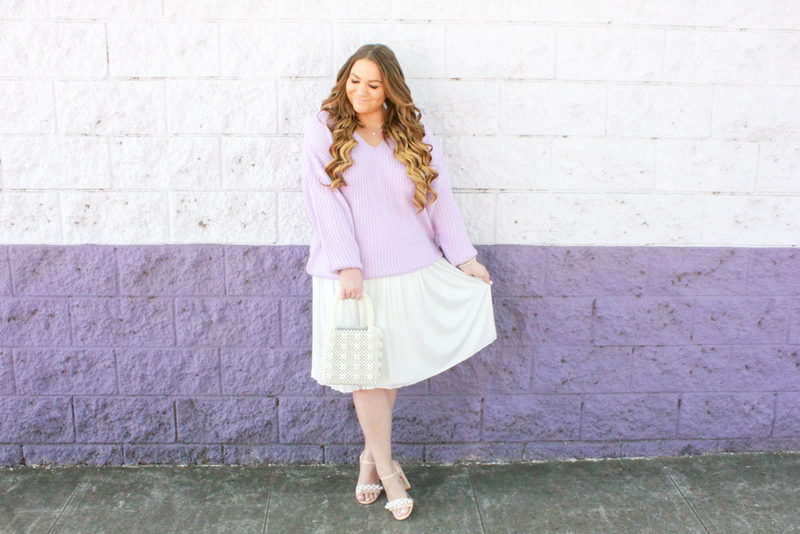 I started stocking up on pastel sweaters during the winter and I styled them with cozy leggings, jeans + more but for spring I felt it was the perfect time to start styling them with maxi + mini + midi skirts like this one here. 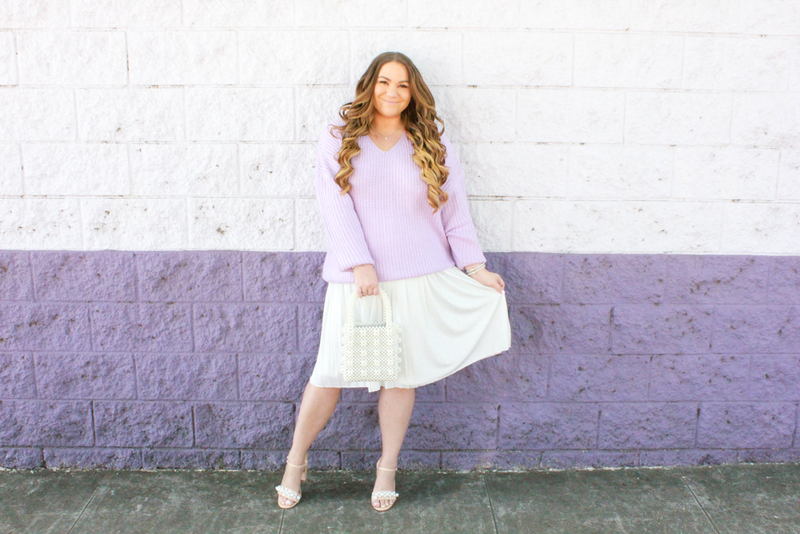 I am linking to a few of my favorite lilac sweaters below (which by the way make for the perfect Easter outfit to hang with family + friends). 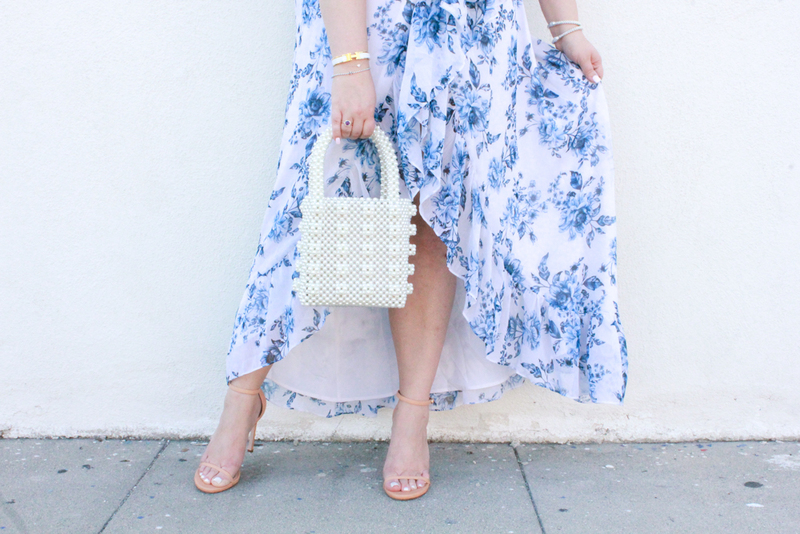 As for my skirt it’s a chic pleated white midi skirt that I think every gal should invest in (I actually got this one on clearance at Charlotte Russe (before they shut down forever). 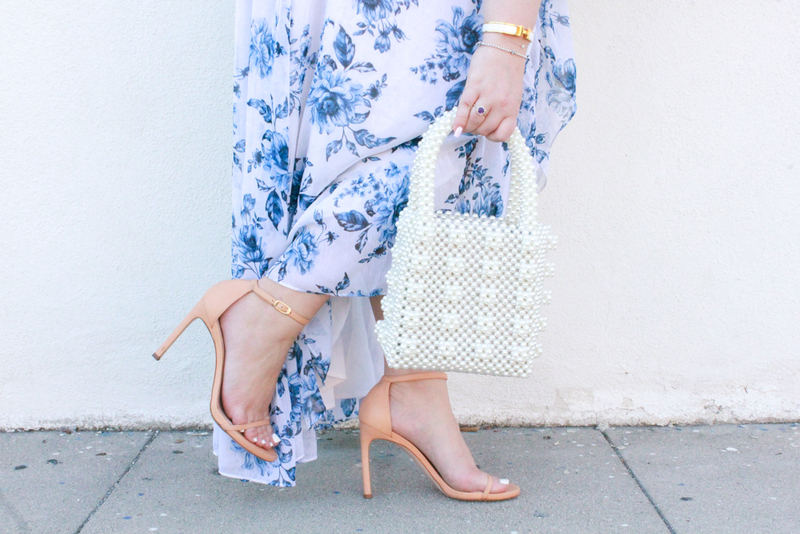 I am also loving all things covered in pearls as of late…bags, hair accessories, jewels + even shoes.